This “glimpse” is an excerpt from the HGEL ebook “Starting and Maintaining a School Garden Program: A Guide to Recognizing Your Saints” which will be available for purchase from the HGEL Groedibles.com store opening Spring of 2011. This “Toolbox” book will include standards-based lesson plans. 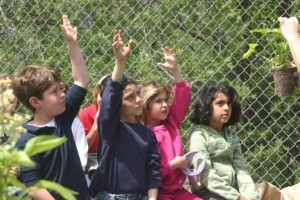 I’ve been a consultant to school districts and individual schools (www.millerkamm.com), running a school garden program, designing native and edible gardens and lecturing to my fellow Master Gardeners about school gardens for years now. I have heard many happy stories about school garden start-ups but, unfortunately, I have come across many more about those that didn’t succeed or fizzled out after a couple of years. I have come to realize that the successful programs began with two elements in common: a collaborative beginning and strong stakeholder buy-in. Stakeholders are defined as “individuals or organizations who stand to gain or lose from the success or failure of a system” as in this case; teachers, administrators, staff, students, and parent groups. 1. 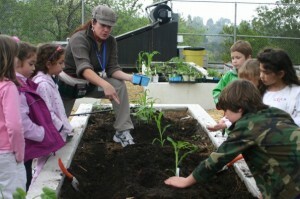 IS THERE A STANDARDS-BASED CURRICULUM LINK IN ALL GARDEN ACTIVITIES? Many gardens start with the narrow focus of nutrition education. While that is a much needed and important aspect, it should not be the only focus if you wish your program to become a lasting and integral part of your school’s curriculum toolbox. Make the garden an invaluable teaching tool to help achieve academic goals in science, math, language arts and social studies and you are making your program virtually “recession proof”. 2. WHO WILL RUN THE PROGRAM? This depends on your school. Designing, implementing and managing a garden program is a large job. You and your stakeholders must decide on a program structure that best suits your school’s volunteer capacity, teacher interest, and financial situation. There are many ways schools run their programs and we’ll feature some of these different formats in later episodes. 3. WHAT IS THE PLAN FOR SUSTAINING THE PROGRAM? I will go into more details on how to address these three questions in the next chapters. As any skilled marketing professional will tell you, you must know your target audience’s NEEDS, FEARS, HOPES AND ASPIRATIONS before you attempt to “sell” them your product (yes “sell”). Knowing these details about your stakeholder group is IMPERATIVE in designing a program that will be embraced wholeheartedly by all! “One of the goals of stakeholder analysis is to anticipate reactions to the project, and build into one’s plans the actions that will help win support for the project. User experience projects have often had a difficult time winning support from management and development teams. This issue often arises later in the project cycle, by which point stakeholders already have had a chance to stake out their positions. 1. You’ve been called to the Principal’s Office! Meet with the Principal. Though you won’t have the fully articulated curriculum design, come prepared with an outline and program options that address Questions Two and Three (above). Leading with the question “What do you want to get out of this program?” is exactly how you start the dialogue. Make it clear that you intend to design the program with input from administration and staff to ensure that the program meets the academic needs of the school. Get the Principal’s guidance on how best to approach the teaching staff. 2. Go to the Head of the Class! Meet with the teachers. How you do this depends on the recommendations of the Principal. You might be able to make a presentation at the weekly staff meeting and follow up by meeting with the grade level chairs individually. As you did with the Principal, after explaining the program broadly, leading with the question “What do you want to get out of this program?” is exactly how you start the dialogue. These meetings will be the first step toward designing your standards-based lessons. Meet with the parent leadership of all parent groups on campus (PTA, Booster, etc) to explain the preliminary plan, your support from the administration and teaching staff. Though you won’t have a definitive budget yet, be prepared to talk about ideas you have about fundraisers and potential grant sources to support the program. You may make presentations at the general meetings, speak at the volunteer recruitment meetings, etc. These are the essential steps in getting started. Follow these steps and you’ll be well on your way to success! To receive a notice when “Starting and Maintaining a School Garden Program: A Guide to Recognizing Your Saints” is available for purchase and other HGEL updates, please sign up for our email list.